Genesis 49:2(KJV); Gather yourselves together, and hear, ye sons of Jacob; and hearken unto Israel your father. In our theme scripture, the Bible paints a deep wisdom in the pattern of submission to spiritual authority. Throughout the scriptures, the Bible gives the distinction between Jacob and Israel. It speaks of how the Lord sent his Word to Jacob and it lit up Israel (Isaiah 9:8). Jacob was the man of the flesh, the physical man. Israel on the other hand was the inner man. The wisdom in submission herein is to HEARKEN TO ISRAEL. That is why imitating a spiritual authority should not be merely after a physical pattern but a spiritual pattern. When your spiritual authority does something, what has Israel done? When he gives an instruction, what has Israel said? Child of God, learn to hearken to spiritual authority not merely as one hearing ‘Jacob’ but as one hearkening to ‘Israel.’ Hallelujah! 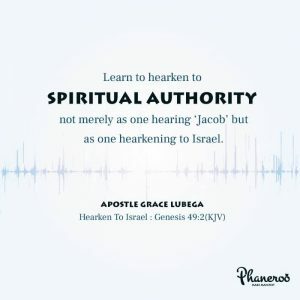 Learn to hearken to spiritual authority not merely as one hearing ‘Jacob’ but as one hearkening to Israel. PRAYER: My loving God, I am grateful for this great and priceless wisdom. I choose to walk in this pattern every day. I receive spiritual instruction not merely as one listening to the words of a man or woman but to the words of God. In this understanding, I grow and mature in the things of the spirit; I receive impartation beyond what is spoken by the mouth but that which is transferred by the spirit. In Jesus’ name. Amen.